What do you consider as the most important factor for a good financial health? I know the most obvious answer to this will be ‘the income that one earns’. But is it the only factor to keep one’s financial life in the best shape? Think again. It is not very surprising or new to hear of people landing up in financial trouble, even after earning well and having a comfortable living. And then too, everything going smoothly or the ‘All is well’ thought might just be one’s assumption. Nevertheless, one needs to take care of certain indicators that signal you of your financial life being in trouble. You must remember that if chances prove to be valid then, you pose a big risk of moving towards a financial peril. Also, in such cases, it might become all the more difficult for you to fix your financial problem. Unfortunately, many a times, people hardly notice that becoming alert with these signs can actually slow down or even prevent the problem from getting worse or reaching its climax. This becomes necessary in case of a sudden job loss. It is seen that people, who are earning pretty well, too are unable to cope up with their basic expenses, in case they suddenly face a job loss. The reason for this can be their insufficient savings to meet any sudden changes. For people who are earning for a few years should at least have a good back up always ready, which will help them survive for a minimum of 3 months. If even after earning well, your expenditure is so high that you do not have enough left to save, then you are moving towards a real financial trouble. This, therefore, becomes the first indicator for your troubled financial position. Having too many responsibilities on one’s shoulders has never been a good option. And moreover, the condition worsens in case one has a debt, which doesn’t result in the appreciation of one’s assets. Few examples of unhealthy debt practices include: large amount of personal loans, car loans, credit card debts, etc. These debts might result in a big outflow of your monthly income in the form of bulk EMIs. One rule to be remembered always is that the total EMI outflow should not go beyond 30% of your salary amount that you take home. The EMI for a home loan will constitute a sizeable portion of this. Therefore, it’s good to avoid any other debts that do not result in increasing your asset value. This is because paying high EMIs on deteriorating assets can also be another indicator of a financial mess. On the professional end, it is very necessary to keep advancing in your career, so as to translate the same into a better income and a better saving. However, despite repeated attempts if one is unable to move up in one’s career path, it means one will have limited investment and wealth building opportunities. It is thus, always beneficial to take proactive steps in sharpening your skills for building a stronger career, and in turn a healthier financial life. Spending too much on functions unnecessarily, either as one’s status symbol or to keep up with traditions, is a mere money wastage, which doesn’t fetch you anything. Realizing this, one can be sure of moving towards a financial trouble. A feasible way to find this is to list out the expenses in the last 5 years on such functions and check how much income has needlessly put into them. A person’s financial life can said to be in trouble if he/she has no asset of their own, even after working for at least 3-5 years. One should have some kind of investments in the form of fixed deposits, mutual funds, PPF or a part of down payment saved for future house. If one has none of these, one needs to immediately put his finances into order, much more carefully. 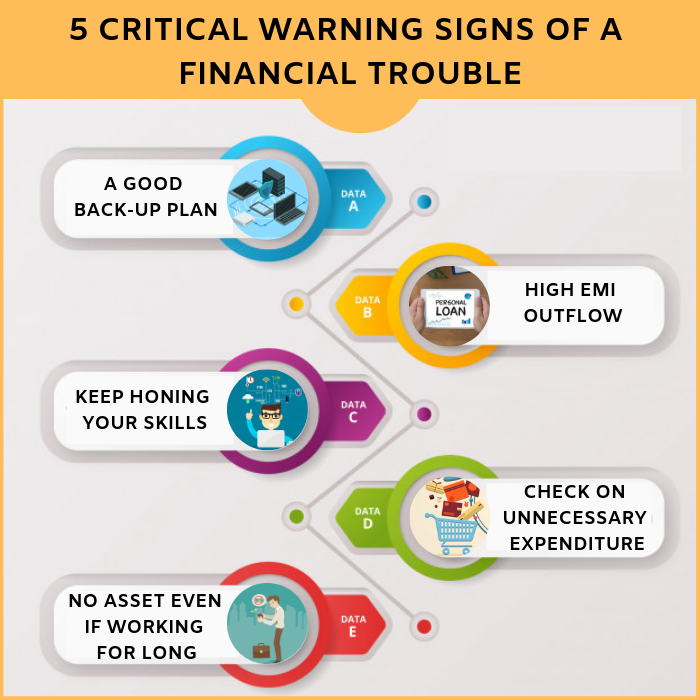 The initial indicators of a disturbed financial life, if not taken seriously, will not take very long to get converted into a problem. A small problems become bigger if you ignore it. So, rather than wasting time in regretting over the past mistakes, it will be better to start acting at the very first thought, also learning and improving upon the earlier experiences. Next Next post: What an Investor Need to know before Investing about Asset Classes?